What is the Umpqua Brew Fest? So, is the Umpqua Brew Fest Roseburg’s version of Octoberfest? Time: 1 to 10:00 p.m.
What kind of beer will be at the festival? Craft beer from Oregon, the Pacific Northwest, and beyond. Whether it’s the breweries’ flagship, seasonal, or specialty beers, we’ll have a variety of styles for every taste. Which beers will be on tap? As they come on board, the list of participating breweries is updated on the Taplist page. It’s a brew fest, but yes, wine will be available for those who prefer fermented grapes rather than barley. Cider and mead will also be offered. Besides craft beer tasting, what else will be going on? Festival-goers will also enjoy beer-friendly food and live music. Umpqua Watersheds, the event host, and vendors and exhibitors will have information and sales booths. An Iron Chef Competition will be going on in the Brew Shed, and football will be playing in the main hall! Admission is $10, includes an Umpqua Brew Fest glass and 4 tickets. You must be 21 or over. A half glass is one ticket and a full glass is two tickets. $1 apiece. Tickets are non-refundable. Can glasses or beer tickets or tokens from previous years be used? No, you must use this year’s Umpqua Brew Fest glass and tickets. What happens when you blow a keg? Sad to say, when it’s gone, it’s gone, but cheers of gratitude will acknowledge the popularity of the beer, recognize the brewery which donated the keg, and thank the participants for supporting the host organization, Umpqua Watersheds. Ticket sales end at 9:00 p.m. and taps shut down at 9:30 p.m.
What identification is required to be admitted? The state identification card and military card must bear a picture of the person, the person's name, address, date of birth, a physical description, and signature. What identification is required to be served beer? You must be wearing an age ID wristband and use the Umpqua Brew Fest glass and tickets to make beer purchases. Have valid ID available, if requested by a server or event security. Are credit cards or checks accepted? Yes! We now have 4 credit card readers so if you are patient, we will accept credit cards. Cash is always best and there is an ATM available. What about the big game? Football will be broadcasted on a TV at the event! Can I bring my child and dog? No, please leave your children and pets at home. No, not inside Douglas Hall. If you must smoke, please use the designated area outside, and please keep at least 10 feet away from the door. What is being done to promote safety at the Umpqua Brew Fest? Individual responsibility is the key to a fun and friendly event for everyone, so please consume alcohol in moderation, enjoy the food, and drink plenty of water or non-alcoholic beverages. We all want to get home safely, so for those who have not arranged for a designated driver, access to taxi service is available. Our local ecosystem benefits because the UBF is a fundraiser for the host organization, Umpqua Watersheds, a non-profit conservation organization. Yes! We can always use volunteers because “It takes a village to raise a brew!” Check out the "Volunteers" tab for more info. We’re always looking for support, whether from businesses, organizations or breweries. Have your people contact our people. Alan@umpqua dash watersheds dot org or you can email umpquabrewfest@gmail.com. How do I contact someone about the Umpqua Brew Fest? If you have any questions or suggestions, contact us: umpquabrewfest@gmail.com. What's the best way to keep updated? Like Umpqua Brew Fest on Facebook, and regularly check the UBF website. Anything else I should know about the Umpqua Brew Fest? * You must be 21 years or older and have valid identiﬁcation to enter the festival premises. * Security searches may be conducted upon entry to ensure the safety of all festival goers. * No shirts, no shoes, no beer. * An age ID wristband must be shown to be served beer. * Tickets, tokens, or glasses from previous Umpqua Bew Fests or other beer festivals are not valid. * Beer is only served in this year’s Umpqua Brew Fest glasses using this year’s tickets. * No more than two glasses at a time are served per customer. * No ticket sales after 9:00 p.m.
* No beer sales after 9:30 p.m.
* Alcohol must be consumed on the premises of the venue. * All festival participants are expected to drink responsibly. *Any person who is believed to be intoxicated will be denied entry. * Security will be notified to deal with persons who appear to be intoxicated during the event. * Anyone causing a disturbance or safety concern will be asked to leave the premises without a refund. * Smoking is not allowed inside the building. A designated smoking area is provided outside the venue, but smokers must be at least 10 feet away from doors. * By entering the event premises you consent to being photographed and or filmed. Your image, voice, and likeness may be used for promotional purposes. * Any photography or video taken at the festival, whether in digital or analog format, is subject to a mandatory, non-exclusive license for Umpqua Brew Fest promotional purposes. 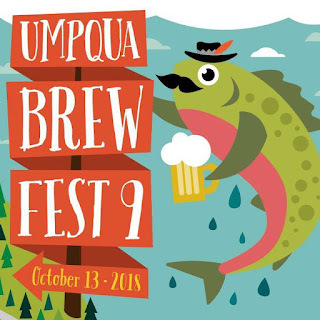 * Umpqua Watersheds, Inc., the host organization of the Umpqua Brew Fest, cannot accept responsibility or liability for any personal property or belongings lost, stolen, or damaged, and cannot accept responsibility or liability for any personal injury, accident or illness.